Alice In Wonderland entices the young and the old. 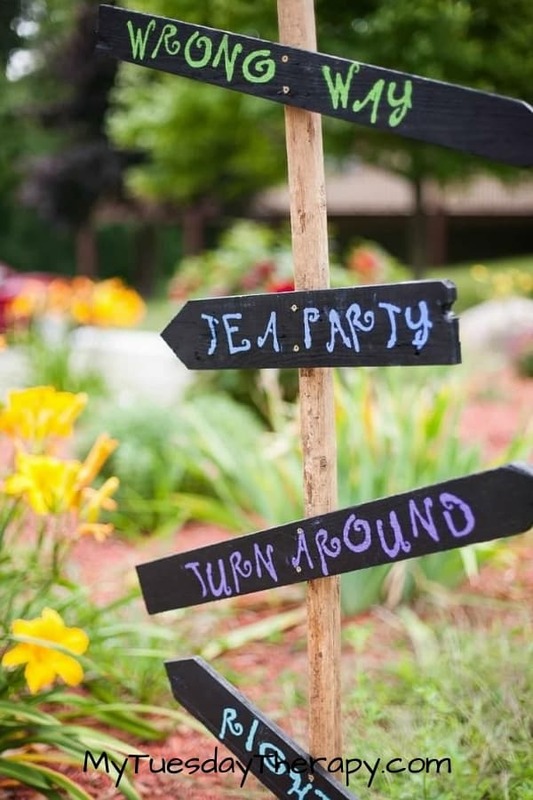 This tea party offers magical time with Alice, Mad Hatter, White Rabbit, and many other unforgettable characters. 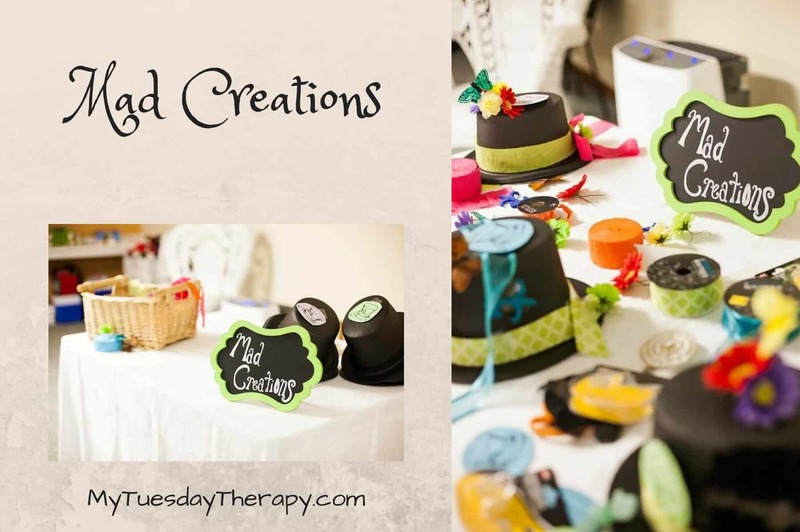 Whether you are hosting a kids party or a bridal shower you’ll find wonderful ideas here. Since the story of Alice is dreamlike with pretty strange things happening you can set the mood for the party with unusual invitations. I love the idea of sending books as an invitation! Get inexpensive Alice In Wonderland books. 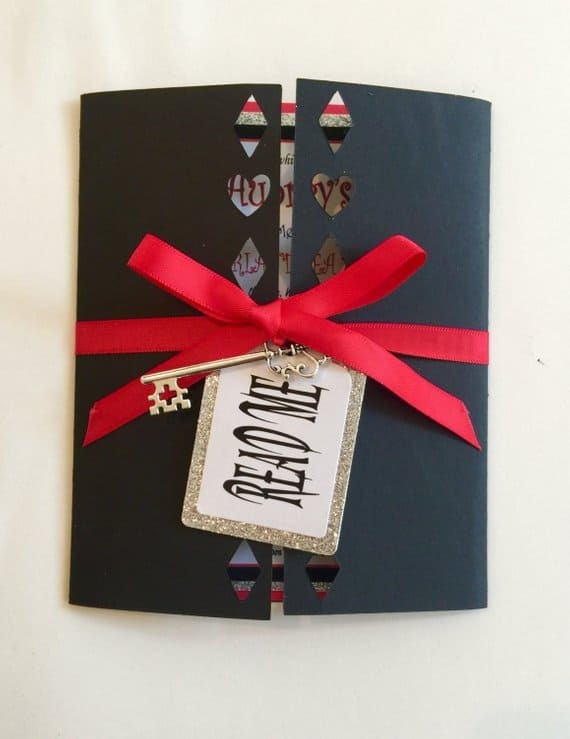 Insert your paper invitation inside the book or you could simply hand write the party details in the book. 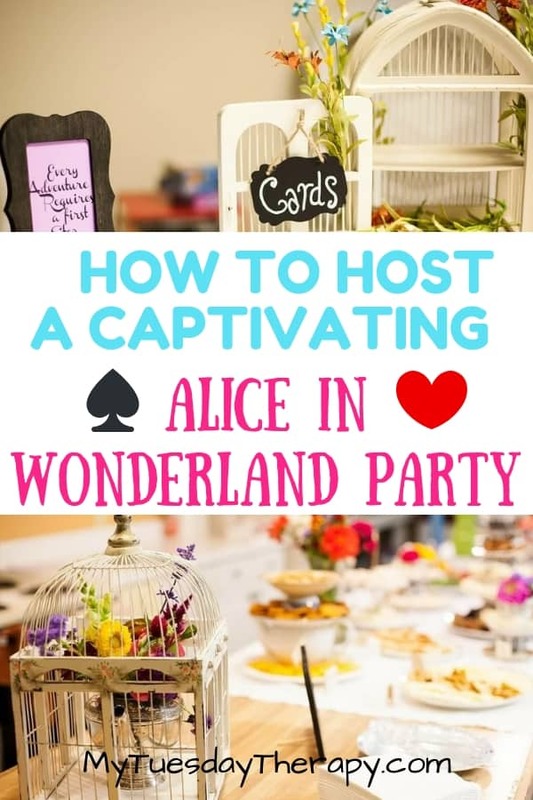 Alice needed a key to enter the Wonderland and so do your guests! Send them a pretty key with a tag as an invitation. The keys from AKeyToHerHeart come in a variety of styles and are about three inches long. They would look great with a lovely homemade tag. The tiny charm keys (from CharmingMaggie) would work well bookmarks. Just attach them to a ribbon. And send them with a traditional invitation or with the book invitation. How cute is that! Read Me! 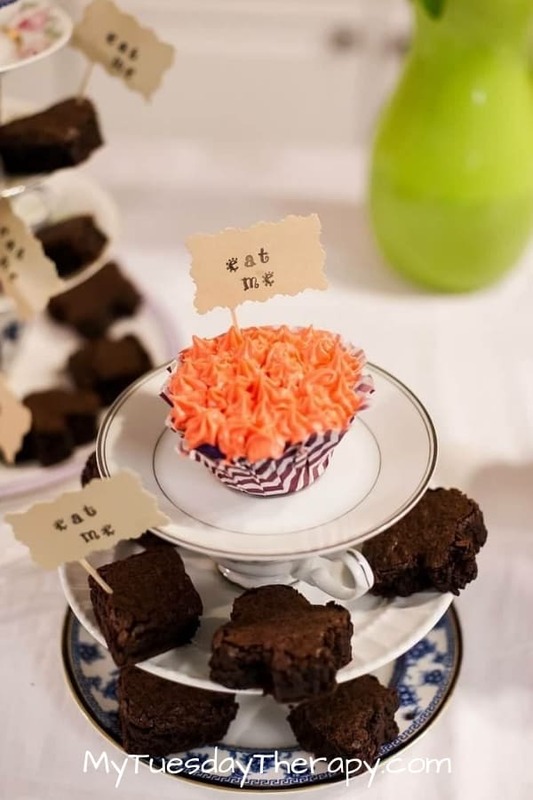 Perfect Alice in Wonderland invitation from the Creation Boutiques. It even has a key! Don’t Be Late For This Wonderland Party! It will be spectacular!! 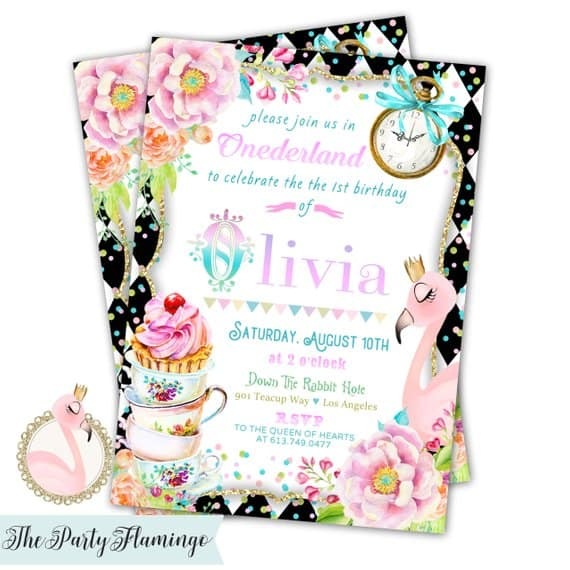 Lovely invitations from BellaLuElla that will get your guests excited about the party!! Onederland. 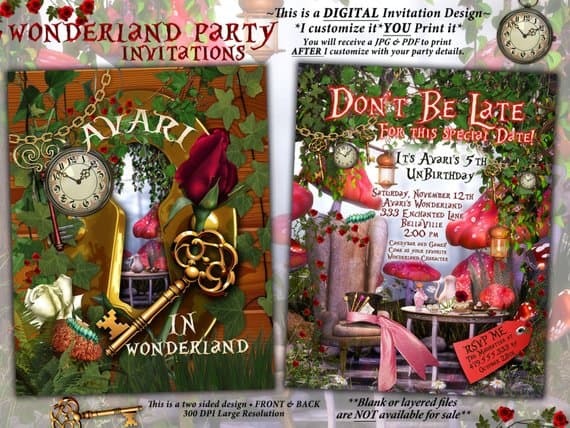 This cool looking invitation is not only for one year olds but can be customized to say Wonderland. I love all the cute details in it: a stack of pretty tea cups, gold watch, and the pink flamingo with a crown. Create an enchanting, dreamlike world. Parties don’t have to cost a fortune to be totally awesome and memorable. 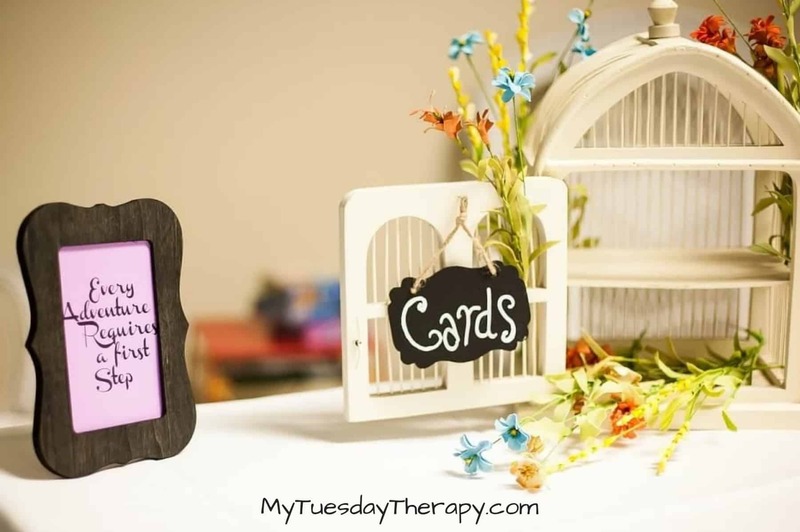 Many times you can find things around the house to create the right atmosphere. Especially for a party like this! Hang sheers and tulle at doorways with tension rods. 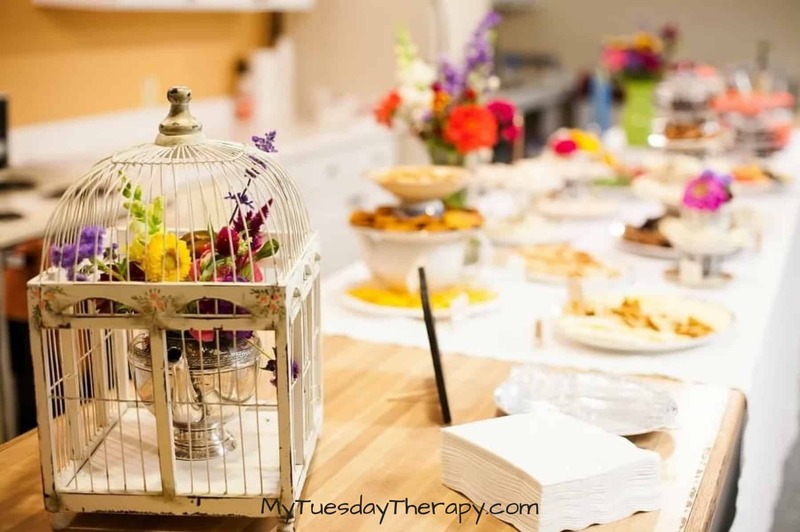 Make a canopy over the tea or serving table with sheers or plastic table cloths. Streamers and ribbon hanging from the ceiling might be just what your party needs. Paint the frames to suit your color scheme. Use mismatched chairs and tables. Cover the tables with colorful table cloths and top with lace table cloths. Decorate umbrellas to look like giant mushrooms. Or cut mushroom shapes from cardboard and decorate them. Scatter flamingos throughout the party area. Hang paper lanterns, banners, and twinkling lights. Stack the books and put tea cups or clocks on them. Just looking at that picture by Vanessa Valencia from A Fanciful Twist makes you feel like you are in a Wonderland! A spectacular entrance to your fun-filled party! 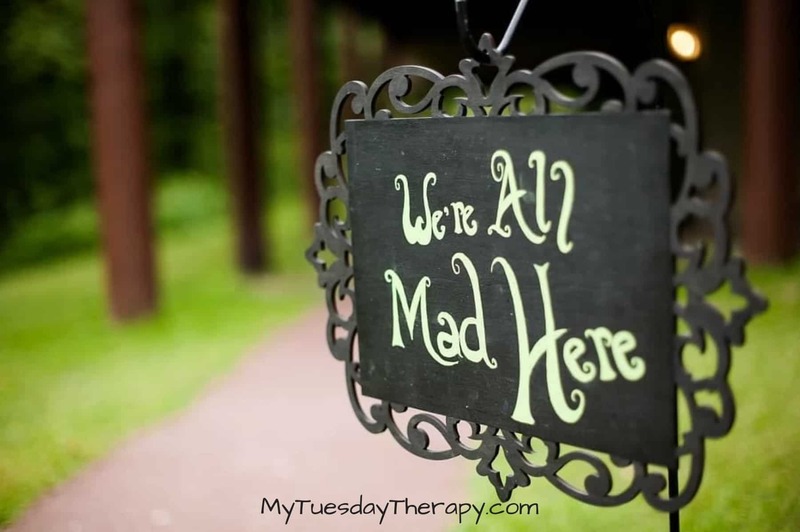 This amazing entrance to the Wonderland Down the Rabbit Hole is from Handpicked Parties. A wedding arch is covered with brown fabric and adorned with flowers, butterflies, and other decorations. The results are amazing! In addition to those three you can also have Cheshire Cat and White Rabbit to join the party. 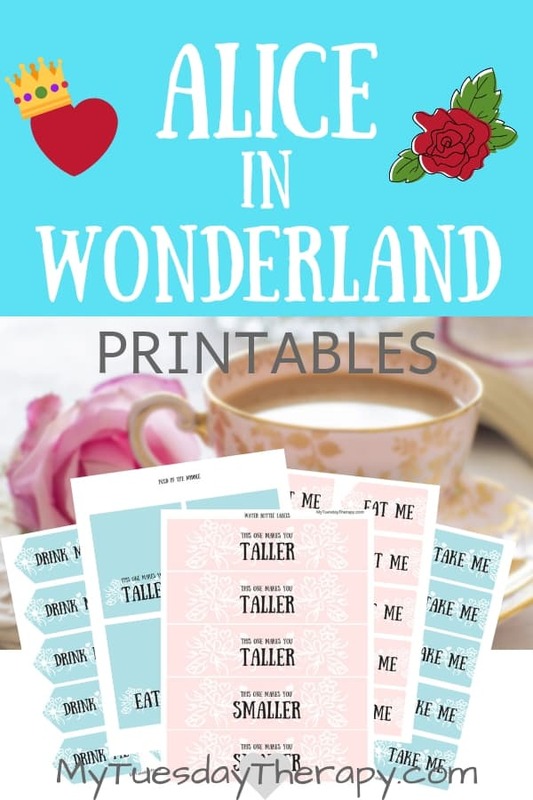 These 2 or 3 ft tall wooden standees from Mountain View Creations make great photo props and add a nice touch to your Alice In Wonderland Tea Party! I also love the quote “Every Adventure Requires a First Step”. and a cute little sign. It would not be a tea party without tea pots. 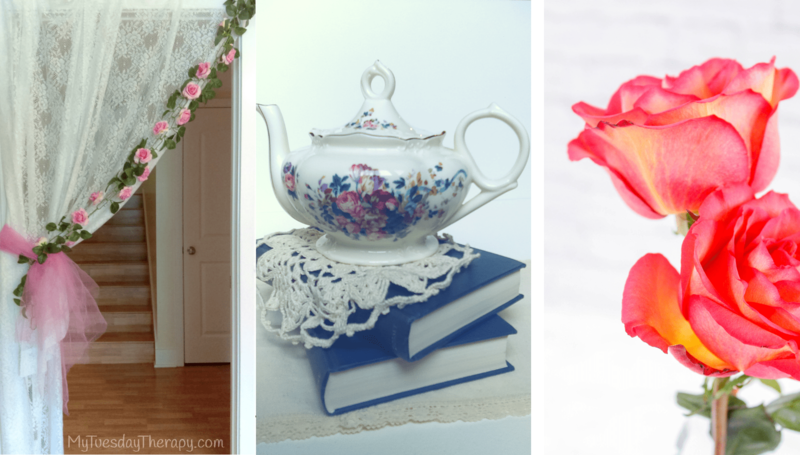 If you search far and wide all the thrift shops in the area you can make great finds like silver tea or coffee pots. Tea pots filled with flowers placed inside bird cages look like something from an enchanted wonderland. Use these to adorn the food table or as centerpieces on the tables. “How long is forever?” “Sometimes, just one second,” answered White Rabbit to Alice’s question. 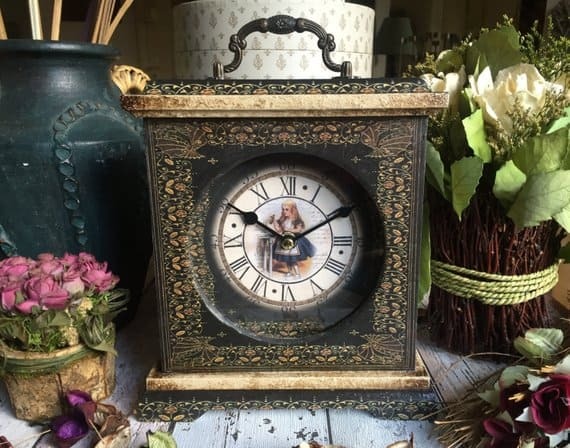 Table clocks, wall clocks, pocket watches… put them everywhere. Hang clock cutouts from ceiling or from the trees. Another cool ideas is to hang up jumbo playing cards or use them to make card soldiers. Cut the head, arms and legs from card stock or cardboard and attach to the game cards. Maggy from Red Ted Art made card soldiers with regular size playing cards and they look awesome. 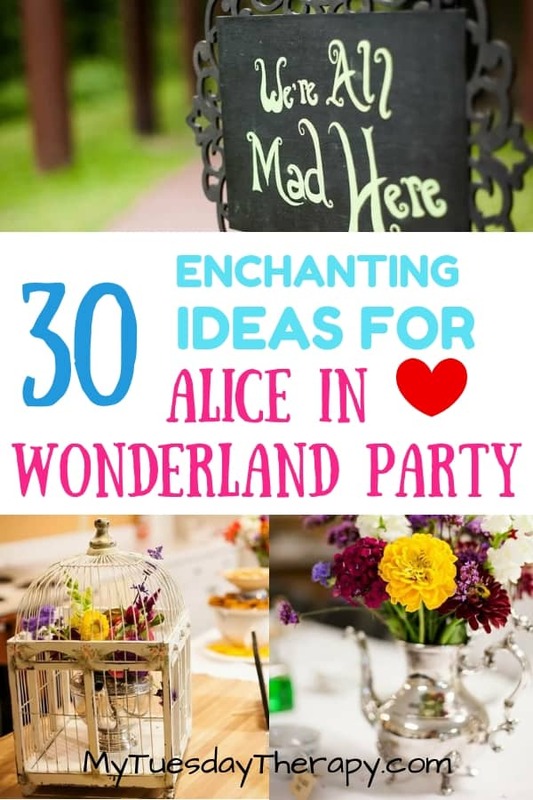 This would also be a fun Alice In Wonderland craft idea for the guests to do! The pretties tea cups ever seen! Serve tea from cute cups of various styles. 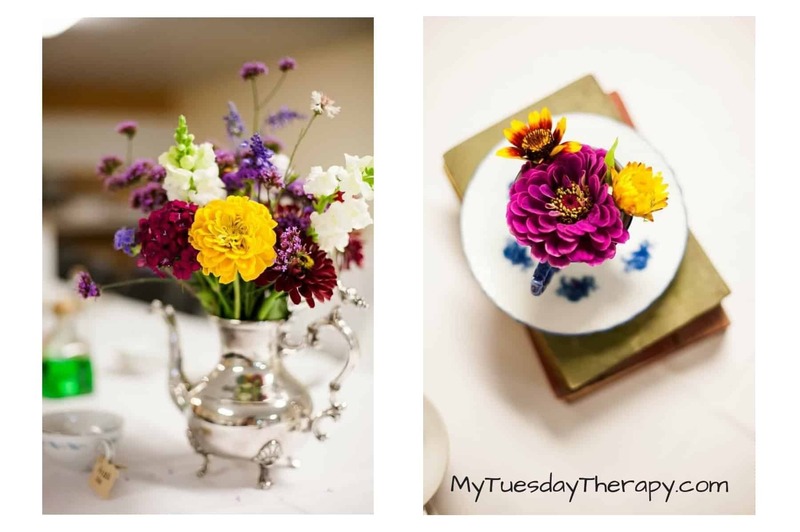 Your table will look amazing with vintage mismatched cups. Fancy cups are not only for adults. Little girls too love to enjoy their afternoon tea in style. I have here several delicious options from chocolaty goodness to savory delights. Most of them appeal to any age. How about brownies cut into suits of cards! Unless you are super awesome cutting shapes with a knife you may want to get suits of cards cookie cutters. Also notice the DIY 3-tier cake stand. You might have everything you need at home to make these! I know not everyone has time to run around shopping for cheap plates and cups. Good news is you don’t have to! Buy your stunning cake stand here. Red Velvet Whoopie Pies, heart shaped, of course, are the perfect tea party food! Delicious red velvet cake with sweet, smooth filling. Though, the Queen of Hearts was quite scary these Cupcakes with Crown Toppers are adorable. Provide some savory options too for those who are not into sweets and for those of us who like both! You can never go wrong with cheese. Turkey-Cheese Roll Ups look cute, are easy to make and are exactly what this tea party needs. Thread the ingredients in any order on skewers. And you are done. Can’t get easier than this. Omit the bread and you have a tasty gluten free savory tea party food. If you get the suits of cards cookie cutters for the brownie bites you could also use them to cut up fruit. They would work well for honeydew, cantaloupe, and watermelon. Colorful, beautiful and so yummy. Kids can’t resist these lovely creations! 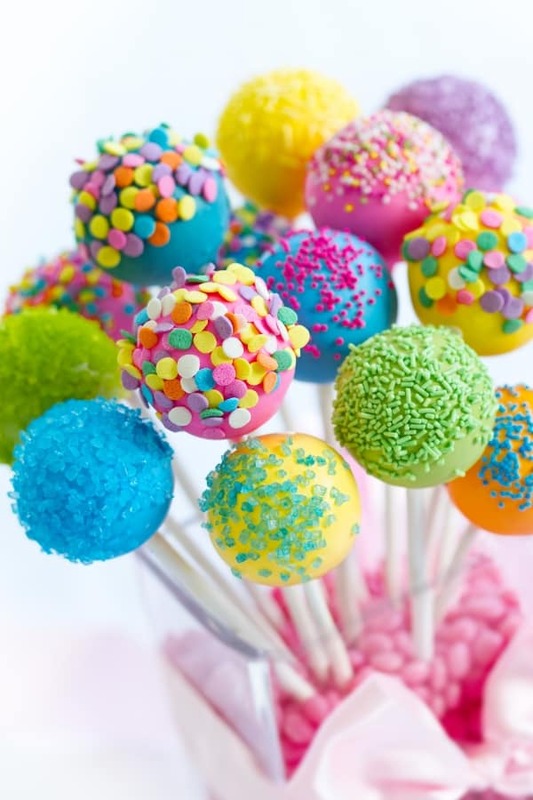 And cake pops are just the perfect size of sweetness. Well, it is a tea party so tea should be on the menu but it does not necessarily need to be hot. I know some who prefer iced tea. And with small kids that would be the safer choice. Raspberry, lemon, and peach tea are super good cold. 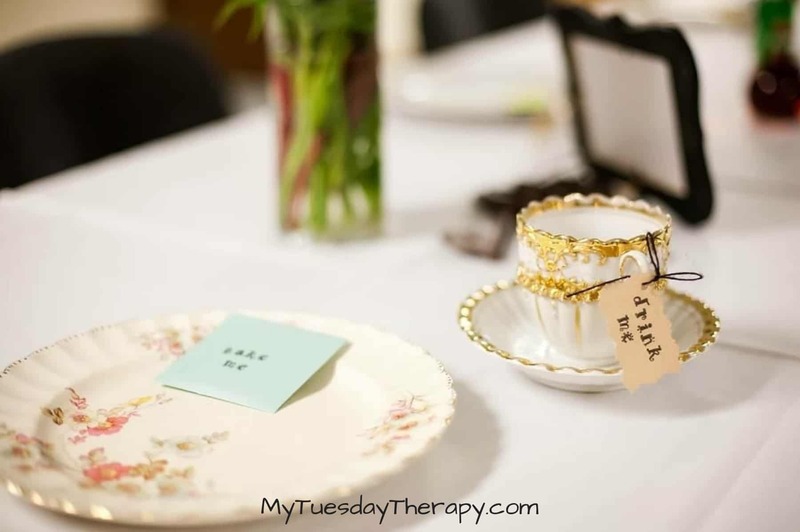 Though sitting and sipping tea is one of my favorite things, every party even a tea party is better with fun activities. Hats and a basket full of supplies to create the most amazing hats fit for a queen. Make it a competition. The best hat maker wins a prize! You can get Cashmere Cat with “grins” either as a printable or as a poster mailed to your home! Kids seem to find “pin something” games funny and I’m sure pinning the grin will delight them too! You don’t need to paint these roses red like the Queen of Hearts’ gardeners did in the royal garden. A stack of card stock, scissors, template, etc. and you are ready to create these beauties! Instructions at Printable Crush. You will have hilarious time playing croquet with these stuffed flamingos! Just grab the legs and hit the “hedgehog” ball. The regular croquet ball would be too heavy for these so you need to have a lighter ball. These were the tallest flamingos I found that don’t cost a fortune. The Peaceful Mom has a cool idea for making your own croquet mallets in her Alice in Wonderland post. The younger guests will have a splendid time making these cute paper tea cups and playing fun games with them. Printable and games at Red Ted Art. 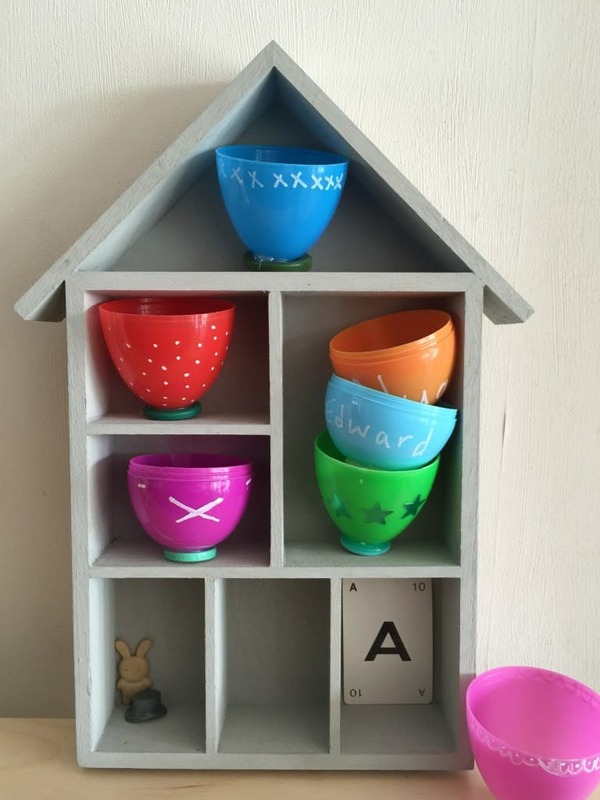 Another cool idea for making tea cups comes from Jenny at The Ginger Bread House. She made tea cups using those plastic Easter eggs that multiply every year. Brilliant way to entertain kids and put those eggs in good use! I feel always weird posing for photos but hey if we all are mad here then why not take some crazy photos. This set from I Got Mad Props has enough props for a group photo! It even has Tweedledum and Tweedledee props. Wouldn’t be Wonderland without them. Though I tend to think of Humpty Dumpty when I see them. Many of the images on this page were taken by Alexandria Kokx at her cousin’s Alice In Wonderland bridal shower.